Nuit de Noël was my introduction to the house of Caron, and what a wonderful exploration it has charted out for me. Caron creations seem unusual to me; they are carefully balanced, possessing a dark languid undercurrent that immediately conjures visions of classical French couture. I do not want to use the term old-fashioned since it is liable to negative connotations, but Caron’s creations have a classical aspect that I do find appealing, if slightly nostalgic. Nuit de Noël was created in 1922 by Ernest Daltroff for his lover, Félicie Vanpouille, who loved Christmas Eve and the scents associated with it. Indeed, it is a quiet, whispering fragrance, conjuring perfectly the silence and the serenity of the night before Christmas. “Twas the night before Christmas, when all through the house not a creature was stirring, not even a mouse…” (by Clement Clarke Moore). 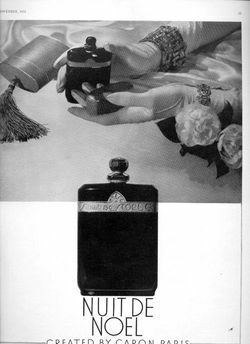 Nuit de Noël is one of my favorite Caron scents because of its interesting composition and exquisite dry down. Overall, Nuit de Noël is a soft wood-based scent with a floral heart. The top notes are very classical rose, jasmine and ylang ylang–dry floral notes rather than a creamy modern composition. The most interesting changes take place after the fragrance dries down slightly. Suddenly the floral blend is dissipated by the wetness of oakmoss. Then the spicy notes become apparent, albeit remaining very soft and intertwining with sandalwood and vetiver. The fragrance does not lose its dry quality which is wonderful and comforting. I imagine walking around in the city as the snow is falling softly. The creamy, dark richness of Nuit de Noël is still intact in the current version of this Caron classic. However, the attenuated oakmoss note makes it somewhat less complex and beguiling. I still like this Caron though for its creamy woods, dark incense and swirl of dark roses. 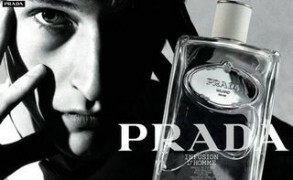 The parfum presents all of these facets beautifully, while the eau de toilette is thinner and sharper overall. Diane: Dear V, lovely, lovely! Although we are only at the brink of summer, I cannot wait for those terrific transitional months (there I go with transitions again) when the leaves start to brown, nature becomes a kaleidoscope of mustards, greens, and reds, and Nuit de Noel makes a reappearance on my shelf. Right now it’s tucked away as I have plenty of spring scents to keep me company. N aka parislondres: Aaaah the extrait of Nuit de Noel is so soft and gorgeous but sadly I just cannot wear it any longer. ScentScelf: Funny, I came here just to refresh my memory regarding BdJ’s take on Nuit de Noel, as I have been thinking this fall that it actually is a good *late autumn* scent for my zone. The bridge between flowers and woody and gently warmed spice — I like smelling this / smelling like this when wearing a sweater of a certain weight, with the chance that some of my skin might still be exposed to fresh air. So, I started to ponder this, and spritzed Nuit de Noel and Clinique Wrappings, just to ponder what implications being swayed by a name might have. Notturno7: Lovely! Thank you for sharing.